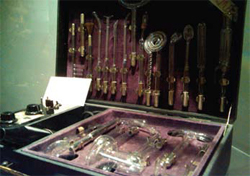 Therapeutic use of electromagnetism has ancient roots, and was first introduced into the US by Hahnemann just prior to 1800. At first, only direct current (DC) devices were utilized in the medical doctor’s office for relieving pain, and for calming “hysteria.” In 1865, however, Maxwell’s equations established electromagnetism as the second universal force, which became a central player in quantum chemistry. More recently it has been described by Stephan Hawking as “controlling all chemical reactions, including life itself”. 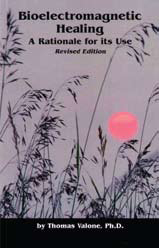 The decline in the use of energy medicine can be traced to the booklength Flexner report in 1910. It declared electromagnetism “irregular science,” purged its teaching from medical curricula, and was published under the aegis of the Carnegie Foundation. Many of the current, limited parameters of the present-day American medical profession originated during the time of the Flexner Report and its aftermath. Flexner clearly doubted the scientific validity of all forms of medicine other than allopathic biomedicine, deeming any approach to medicine that did not advocate the use of treatments such as vaccines to prevent and cure illness as tantamount to quackery and charlatanism. Medical schools that offered training in various disciplines including eclectic medicine, physiomedicalism, naturopathy, and homeopathy, were told either to drop these courses from their curriculum or lose their accreditation and underwriting support. The results of such a narrow approach to healthcare is still felt today with almost half of all Americans taking at least one prescription drug. Further, doctors aren’t taught biophysics or electro-medicine in medical school so they simply don’t know the extent of the multifaceted biological landscape of the body. Sadly, the financial infrastructure of healthcare has evolved in the past century away from a patient-centric system. Instead, more expensive innovation, such as MRI testing machines that generate income to the healthcare delivery system, are the only type of electrical technology familiar to doctors. Regardless, there does continue to be a strong interest in energy medicine that can save healthcare. Recently labeled “Star Trek Medicine”, the devices do not have the usual monthly expenditures to administer daily doses. Health practitioner Ryn Raevis and her patient gave lectures at the 2003 Tesla Science Conference and Expo sponsored by Integrity Research Institute (DVDs available) where they both described the remarkable reversal of a gangrene leg on the patient with several days of treatment with a professional pair of electrotherapy devices, when conventional doctors repeatedly offered amputation as the only solution. The same devices also have reduced rehabilitation time by 65% in clinical trials. The patient is still walking with both legs today, without any recurring infection and pain-free. Energy medicine also uses electricity to create the magnetic fields. In clinical trials, osteoarthritis treated by pulsed magnetic fields showed the treatment group improved substantially more than the placebo group. The applied magnetic fields act to suppress inflammatory responses at the cell membrane level. Thus, even NASA conducted a study finding that the rise time of the pulse was the most important ingredient for effectiveness. The late Glen Gordon, MD cited the NASA study often after he designed a small, pulsed magnetic field device that he sold for a while. He also bicycled across country afterwards to prove how healthy the treatment had made him. At the other end of the spectrum, there are those who think that lengthy, regular, daily exposure of over one hour per day to electromagnetic fields from cell phones near the head are detrimental, and this has been confirmed in the most recent findings by the INTERPHONE Study Group. However, the same study also found “protective” effects that reduced the average incidence of cancer or in other words, “apparent protective effects at most doses.” Bioelectromagnetic healing science explains that short-term exposure to a wide range of electromagnetic frequencies and intensities will boost the immune system by allowing the body to absorb a small amount of the multi-frequency energy. Our institute has had great results using a high voltage device patterned after the historical “Violet Ray” which even today has wide applications. Such electrotherapy provides electrons directly to the deep tissue layers to attack free radicals directly, which this author has shown are the real antioxidants that also are the active ingredients in vitamin pills. Electrical fields across membranes are one of only two ways the body stores energy (the other is chemical), so everyone feels more energetic after a short high voltage field exposure. Lastly, an inside source has confirmed that senior administration officials just met with a financial expert with impeccable credentials and several retired military officers with medical degrees in order to put biophysical energy medicine on the fast track for the health and welfare of military personnel. 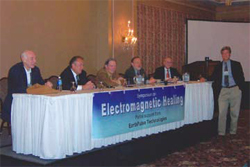 More of the history and latest developments are found in the author’s book, Bioelectromagnetic Healing: A Rationale for Its Use.